I love Thing #1 and Thing #2! I (loved) or I (hated) the movie! Can we read Green Eggs and Ham, too? 32 eyes blink brightly up at the pages as I turn them. Several mouths move without sound to recite along with me. Oh, did I mention that these are seniors in high school? 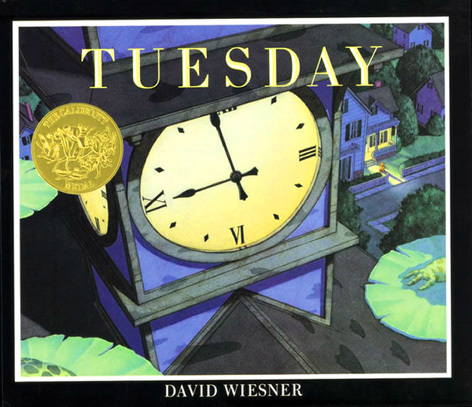 Tuesday by David Weisner. We use this text for our 9th grade mythology unit because a myth explains the unexplainable. Our students have to create a myth for why frogs might lift off from a local pond and terrorize some inhabitants of a small town (see post). 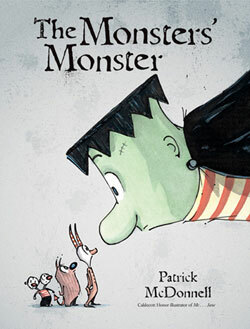 The Monsters’ Monster by Patrick McDonnell. This mash-up of the 1931 film Frankenstein and Mary Shelley’s 1818 novel is ideal to stimulate discussion on the relationship between a creator and the created. In McDonnell’s version, however, the Monster is sensitive, compassionate, with more of an interest in warm, powdered jelly doughnuts than in seeking vengeance…a nice break from the rigors of Advanced Placement English Literature. 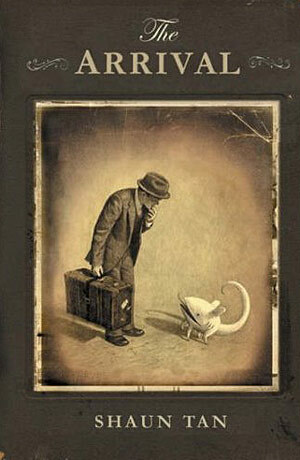 The Arrival by Shaun Tan. Surreal images capture the point of view of an immigrant experience which makes this wordless text ideal for students who are studying Ellis Island or Angel Island. Many of the illustrations are available on the website so students can look at the haunting pictures on their own devices as well. 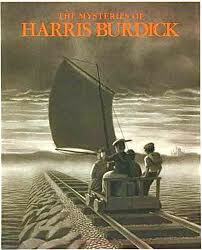 The Mysteries of Harris Burdick by Chris Van Allsburg. A book full of provocative images that has inspired thousands of stories explaining the mysteries in each sepia toned drawing. 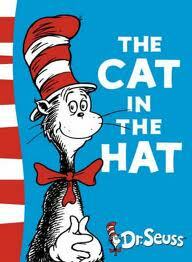 This book is wonderful for writing classroom, and there have been contests for the best stories written by children. Celebrated children’s authors have also taken an opportunity to try their imaginations using the pictures as story prompts in The Chronicles of Harris Burdick. 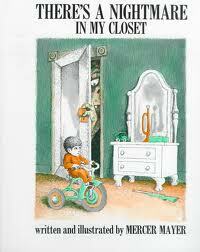 The Monster at the End of this Book by Jon Stone; illustrated by Mark Smollin and There’s a Nightmare in My Closet by Mercer Mayer. Both of these books have been incorporated into our Heroes and Monsters English IV (grade 12) elective. I use them as a starting point for an inquiry project about images of monsters given to children contrasted with the images of monsters we know as adults. Most students discuss the “fuzzy factor” with cute, loveable old Grover as something they remember fondly. They also remember very clearly the monster that lived in their closets. The anxiety of Mayer’s “Nightmare”, sobbing at the foot of the bed, usually brings about a discussion of facing fears. 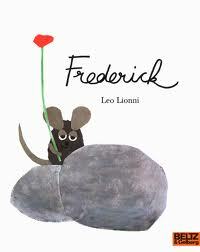 Fredrick by Leo Lionni. What does the poet do for society? This little fable answers that question and works well in any poetry unit. Frederick’s use of language paints pictures in the minds of the other mice who are struggling through a particularly bleak winter season. There is a delightful video recording of this to share in class or to have students watch on their own (flipped classroom). The story presents opportunities to use other fairy tales for students to practice retelling stories from another point of view once they buy into Scieszka’s formula. 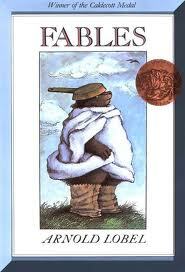 Fables by Arnold Lobel. Here are modern little fables that are one page long with morals such as “It is the high and mighty that have the farthest to fall.” One year, I used these fables with my drama class as short sketches. My favorite sketch to watch was the story of the Lobster and the Crab where the insanely spirited Lobster took timid Crab out for a ride in a boat during a tremendous storm. When the boat capsized, the student playing Crab cried out in despair, “Horrors!” while the student playing Lobster jumped and shouted with glee.”Down we go!” she yelled at the top of her lungs. The Crab was shaken and upset. The Lobster took him for a relaxing walk along the ocean floor. The same can be said for using children’s literature in high school. OOh, I did not know that may of The Arrival’s images were available online. It is great that older kids get to learn via picture books too! Nice choices. Wonderful list! I’ve decided to incorporate picture books into all of my college courses this year (I love them too much not to try to spread the love!) This post has given me several ideas to use, so thank you! Once kids get over “picture books r 4 kids” the possibilities for creative sharing are endless. School Librarian, St. Louis. Thank you for the great ideas. I am moving from a primary school to a high school and would love to be able to bring some of the wonderful picture books with me. High school students love to be read to…and listening to stories. Picture books get to a message so much faster than a novel, and the visual component is great for those visual learners. They are great “openers” and if you have the primary school background on how to use these texts, you will have an advantage..Good luck! Great list! The Monster at the End of This Book almost made my list too! Thanks.